Michael Richards, left, and Jerry Seinfeld chat about working together on "Seinfeld" in the last installment of the web series "Comedians in Cars Getting Coffee." 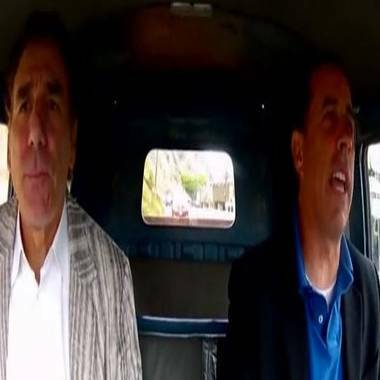 Jerry Seinfeld's web series "Comedians in Cars Getting Coffee" has been a reliably hilarious glimpse into the world of Seinfeld and his famous comedian-type friends. But the recent installment, starring former "Seinfeld" co-star Michael Richards takes a decidedly more serious turn. If you recall, Richards was caught on tape at an L.A. comedy club responding to hecklers in the audience with a shockingly racist tirade, calling the hecklers the "n-word" and referencing a time when blacks were often victims of civil rights abuses. The fallout was immediate -- the public turned against him and he apologized, but Richards tells Seinfeld the wounds are still very present. "I think I worked selfishly, and not selflessly," Richards said of his time on "Seinfeld." "It's not about me, it's about them (the audience). That's the lesson I learned seven years ago when I blew it in the comedy club and lost my temper because somebody interrupted my act and said some things that hurt me and I lashed out in anger. I should have been working selflessly at that time." Richards then clarified that the rumor that he'd done several comedy sets since is not true. "No. I busted up after that event. It broke me down. It was a selfish response, I took it too personally. I should have said (to the hecklers), 'You're absolutely right, I'm not funny, I'm going to go home' ... Inside it still kicks me around a bit." "That's up to you," Seinfeld replied to Richards, who he's stood behind throughout the incident. "It's up to you to say 'I've been carrying this bag long enough, I'm going to put it down.'" At this point it's interesting to note that unlike any of the previous episodes of "Comedians in Cars Getting Coffee," this one begins with a caveat: "Certain events in this episode seem set up. They were not." Whether that applies to a strange mix-up at the beginning of the show when Richards and Seinfeld think they're knocking on boxing great Sugar Ray Leonard's door (it's actually the home of actor/comedian Jay Mohr) or Richards' candid remarks, or both -- who knows? But, one thing is certain: the incident in the club has forever impacted Richards. Where the rest of the "Seinfeld" cast has moved on, he's still struggling with that one awful night. Hair we go again: Should Jason Alexander embrace the bald?